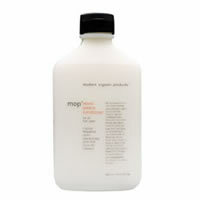 MOP Mixed Greens Conditioner is a daily conditioner that aims to help dry and damaged hair. MOP Mixed Greens Conditioner contains a potent blend of natural ingredients, such as Artichoke, Cucumber, Parsley, Watercress and other Certified organic extracts combine to moisturise even the most dried out and damaged hair. To this strong mositurising mixture MOP have added a touch of Rosemary Oil for shine, organic Olive Oil to nourish and Certified organic Apple Cider Vinegar for extra softness and manageability, giving your dry hair the nourishment that it deserves!